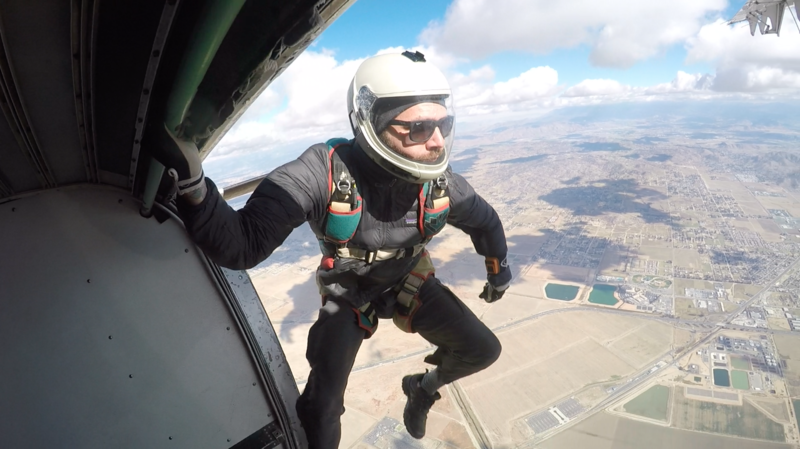 Reputable manufacturers will require that you either have a minimum of 200 skydives, or some communication with your FJC instructor or BASE mentor establishing that there is BASE training in your near future. If you’re in the early stages of your skydive career (say less than 100 jumps) and you are super focused on BASE jumping, my first advice would be to take it easy – you have your entire life to kill yourself BASE jumping so don’t be in a hurry. But that often falls on deaf ears, so if your eyes glazed over just now and you started skimming, here’s what you should know. Becoming familiar with your BASE gear is a big step in your BASE progression, the importance of which is commonly underestimated by new BASE jumpers. If you are the type of person who can’t handle owning a gun because the temptation to point it at yourself is too great, then you’re probably not the type of person who should own BASE gear before you get some training. But generally speaking, it’s a good idea to get your gear ahead of your BASE course and learn how to assemble, pack, and configure it for different applications. Because most BASE courses take place only in the BASE environment, and because many BASE jumpers don’t skydive their BASE canopies, there is a minor epidemic of bad canopy piloting in the BASE world. Believe it or not, some BASE instructors are below-average canopy pilots. There are even quite a few jumpers who are competent canopy pilots in the skydive environment, who perform poorly in BASE because they are not familiar with the full control range of their BASE canopy. You cannot learn as much about your canopy from a 500’ bridge as you can from a 4,000’ hop-and-pop. Canopy skills can and will save your life and limbs, in BASE. When we take into consideration all of the points above, it leads to this conclusion: Get to know your BASE canopy in the skydive environment before you BASE jump it. You will reduce the chances of injuring yourself and you will get more out of your first BASE jumps if you are able to land your BASE canopy accurately, use its full control range with confidence, and execute heading-corrections quickly and effectively. Become intimately familiar with the stall characteristics of your BASE canopy. Learn to fly it backwards using risers and brakes. Learn to make heading corrections with brakes stowed. Learn to land on rear risers, in preparation for a dropped-toggle scenario. 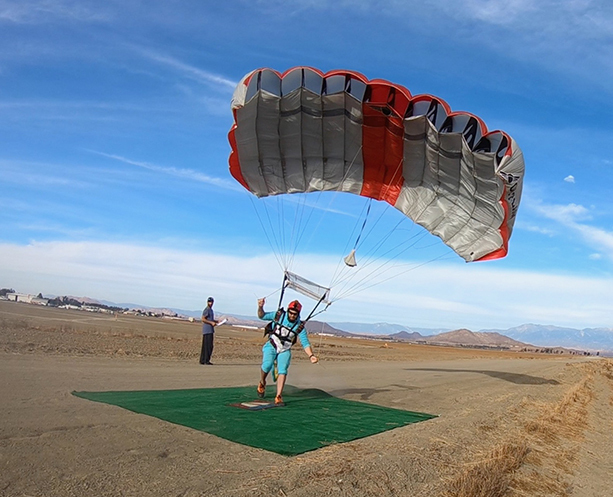 Learn to land using front risers for accuracy and flare during your approach. Become comfortable with steep accuracy approaches, using deep brakes. Learn to land accurately and flare from quarter, half, three-quarter brake approaches. Practice rapid heading corrections using brakes. Practice rapid heading corrections using risers, with brakes stowed. Practice recovering from line twists quickly. Learn to land accurately – and I don’t mean “in the LZ”. I don’t even mean in the peas, or near the cone… I mean, on the cone. If you’re really an A+ student, then you can even dial your parachute’s Deep Brake Setting too, while you’ve got the altitude (talk to your BASE instructor or mentor about DBS). Rent or borrow a skydiving container that has a main compartment large enough for your BASE canopy. If you choose a lightweight BASE parachute, then you will have a better chance of it fitting into the container you’re using already (a lightweight 250 will fit into many main compartments designed for a 9-cell ZP design). If it doesn’t fit into your own container, negotiate a good container rental rate from your local shop or rigger. Use acceptable risers (many 3-ring risers designed for BASE are NOT suitable for use in the skydive environment). Learn what to do with that slider (if you’re not careful you can have a dangerously hard opening using a BASE canopy for higher airspeed openings). This could include using a specific high-airspeed slider from the manufacturer of your parachute, and using slider control techniques to stage its descent properly. Learn how to pack it. 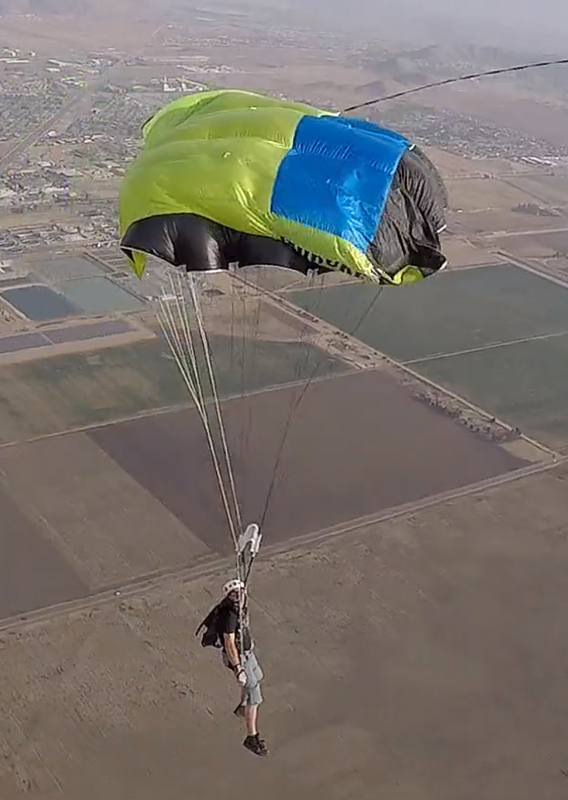 You might “free-pack” it using the tail pocket on the parachute, or you might use the deployment bag that is mated with the container system. You don’t have to do a BASE specific pack job when you’re jumping it from an aircraft, but this is a great opportunity to start practicing elements of it anyway. Learn what PC is appropriate. This will depend on your delay, the size of the parachute, and how it’s packed. Keep in mind that your BASE canopy will fly differently depending on whether you are towing a collapsed skydiving PC, a 32-ish inch non-collapsible BASE PC, or a typical 42”+ BASE PC that you’ll use during your first real slider down BASE jumps. Don’t break your neck during a terminal slick opening (stick to hop-and-pops for now). Don’t do silly things in the traffic pattern (practice your maneuvers in an approved part of the DZ airspace). Know what to expect from the flare, responsiveness, and glide performance of your canopy. Remember that landing any canopy in a light and smooth headwind is easy, but BASE is usually not like that. Be sure to practice landing in zero-wind conditions!